Repairs and patching have been underway all year on parts of the landmark two-level bridge, which was built in 1965. More than a quarter-million vehicles pass there per day. All four southbound lanes at the I-5 Ship Canal Bridge have reopened, but traffic snarls continue to clog the freeway from Northgate to Sodo — where two box trucks crashed around 3:30 p.m. and weren’t cleared by tow trucks until 5 p.m.
Work crews closed two southbound lanes on the Ship Canal Bridge to patch a hole in the concrete, about 2 feet-by 4 feet, that appeared midday, exposing rebar and pavement fragments. The crash three hours later blocked two of three lanes in the I-5 mainline, beneath the I-90/Edgar Martinez Drive South overpass, a state photo showed. The Washington State Department of Transportation (WSDOT) advised drivers to use other routes or cancel trips. Besides delaying drivers, the hole made buses late heading into downtown to pick up commuters for Lynnwood and Everett routes, transit agencies warned. Repairs and patching have been underway all year on the landmark two-level bridge, which opened to traffic in 1962. More than a quarter-million vehicles pass there per day. “The bridge is quite old and it’s taking a lot of wear and tear,” said spokeswoman Ally Barrera, from the WSDOT traffic control center in Shoreline. “We do have plans to do a complete deck rebuild, but we don’t have funds available until 2026,” she said. The deck is unlikely to survive that long without constant repairs, so it will be up to lawmakers to decide whether their Connecting Washington program — which includes some $9 billion in highway budgets funded by an 11.9-cent gas-tax hike in 2015 and 2016 — should be altered to protect the state’s most critical span. Other major work has caused weekend closures this summer in Sodo, with occasional Ship Canal Bridge repairs done concurrently. As to the hole that appeared Wednesday, it was unclear whether old concrete or a recent patch failed, said Barrera. 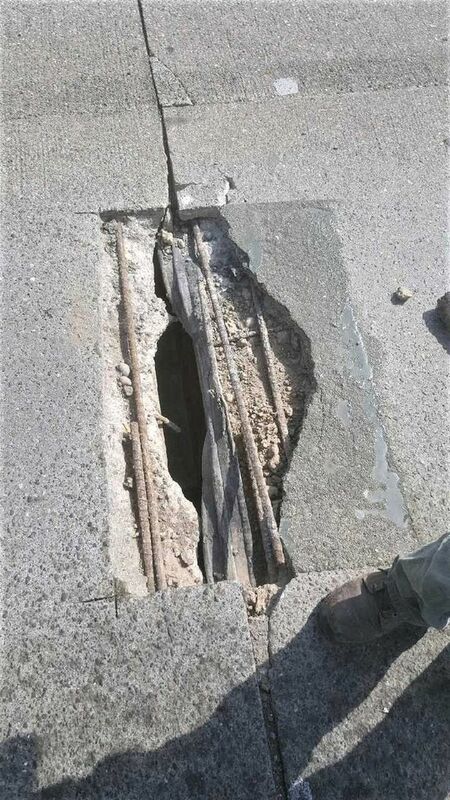 A WSDOT picture showed exposed rebar and more than one shade of pavement.